The Magatama Jewels are magical relics from ancient lore that can mysteriously imbue the user with enhanced power, strength, and abilities. They are commonly depicted as crescent or tear-shaped beads; though, stories of these jewels in other lavish forms have been told as well. 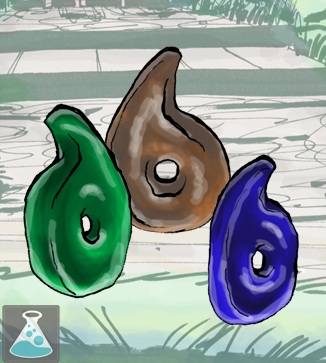 Those who don’t recognize the capabilities of the Magatama sometimes find these and wear them as precious jewelry; those who do appear to understand the power that the Magatama can possess worship these, and those who hold them, like deities. Vague rumors have also circulated that these jewels can be used in some shamanistic practices to channel the souls of the gods and the deceased, maybe even allowing new deities to be borne from them! According to Mr. Tofu, the mysterious woman in the woods has claimed to be seeking these out in order to gain enough power to traverse the Kitsune realms without a significant loss of power.